DoubleLines fixed-income expert also says dollar is likely to rise further and oil could weaken. DoubleLine founder Jeffrey Gundlach shares his fixed income and market views each quarter. DoubleLine CEO and CIO Jeffrey Gundlach says the fund family’s Total Return Bond Fund (DLTNX) could close to new investors in 2015. The DoubleLine Total Return Bond Fund was launched in April 2010. For the 12 months ending Oct. 31, its retail-investor shares improved 4.98% vs 2.73% for the Barclays U.S. Aggregate Index, which tracks bonds. In contrast to PIMCO Total Return’s outflows, the DoubleLine Total Return Fund had net inflows of about $804 million in November, according to Morningstar. DoubleLine says its inflows were close to $820 million. In general, Gundlach says, investors can buy and hold DoubleLine funds. “If the Fed raises rates, bonds should do better – not worse – as is happening already. If you are really worried about a long-term rise in interest rates – and we are not – you should move into our flexible, low duration bond fund,” he noted. The fixed-income specialist says investors benefit from being in dollar-denominated holdings right now. “The dollar is smoking hot, and the U.S. could raise rates, so it would strengthen vs. virtually all other currencies,” he said. While the U.S. economy and currency remain strong, many other parts of the world are facing big challenges, and commodity prices continue to drop. 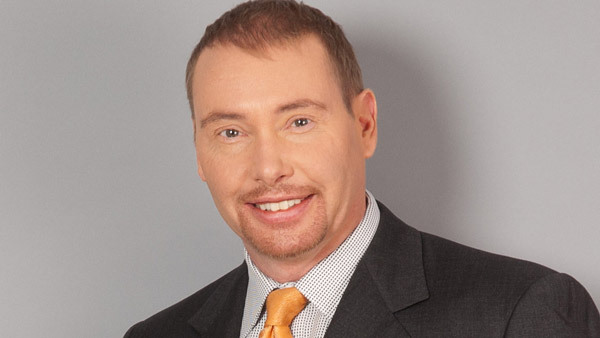 “We could end up importing some deflationary aspects of the world economy and that could come at the price of U.S. growth,” Gundlach explained. For these and several other reasons, he says, the Federal Reserve’s push for raising rates is worth questioning. As for gold, it’s had a good year after a dismal 2013 and has done better than currencies like the yen and the euro. “And with trouble in the EU brewing, it’s [playing out] in precious metals,” he said. Elsewhere, “Japan is off to the races with further devaluation. It looks like the start, to put it harshly, of a currency war,” Gundlach explained.